Our purpose in this city is to be salt and light for the Hindu people, to plant and water with tears, sweat and love so that from the soil of Hindu communities God may grow house fellowship movements led by local heads of households who are guided by His Spirit. 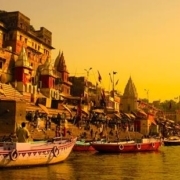 Varanasi is famed as the ‘oldest city in the world’ and the ‘epicenter of Hinduism’. Under the British rule the city was called ‘Banaras’ however the ancient name of the city is Kashi…which means ‘City of Light’. We are Friends Network take this as a prophetic word for God’s purpose for this city; that many would encounter the ‘Light of the World’ (John 8:12), Jesus Christ, in this city. There are many opportunities for you to join in what God is doing here. We highly value that all who work with us have a solid foundation in the local language (Hindi) and understanding of Indian culture. In Varanasi, we offer a two-year ‘Language & Culture Internship’. During this two years you will be guided in learning the Hindi language and brought through in-depth study of the Indian culture enabling you to serve more effectively among Hindus all over the world. During your season of training you will participate with the long-term team’s ministries (outlined below). After the two years you can choose to stay on in Varanasi or move on to work elsewhere.